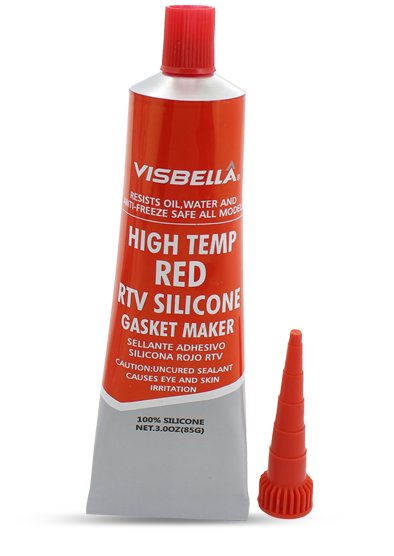 A high temperature RTV silicone designed for bonding and sealing in automotive applications. 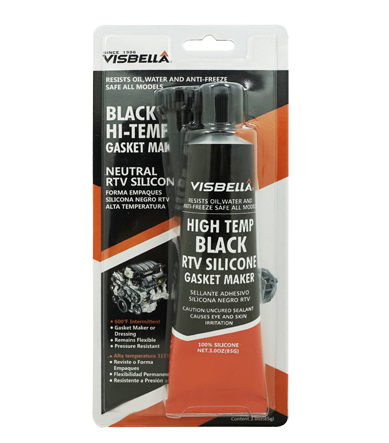 A high temperature RTV silicone designed for bonding and sealing in automotive applications. It forms to any size or shape gasket, and is resistant to both temperature and migration caused by thermal cycling. Can withstand temperature from -80°F up to 650°F (343°C). This product is a one compound RTV silicone sealant that cures completely without excessive odor release. It’s acidic and neutral components solidify into an elastic rubber strip. It’s ideal for timing covers, intake manifolds, exhaust manifolds, cylinder heads, carburetors, and more. How long should the silicone cure for before it is 100% cured at full strength? The set time for this product is 1 hour and the cure time is 18 to 24 hours. Will the silicone resist water once it is completely cured? Yes, once the silicone is completely cured, it will resist both water and oils. What is the maximum temperature that the silicone can handle? Does the silicone shrink when it is curing? No, the silicone will maintain its shape during the curing process and becomes an elastic solid when it is fully cured.